After ten months of knitting (a little here, a little more there), the Danish Tie Wrap Shawl is off the needles and on the shoulders ~ two sets of shoulders, that is! Sunshine is as delighted by the finished wrap as me. An easy knit for sure, but any shawl project winds up being a slight slog as I never seem to have the time to sit down and really immerse myself in it like I’d like. I envy those who can spend an afternoon knitting, curled by the fire while children occupy themselves happily. It simply isn’t like that around here, though maybe in another five or ten years! However, I do find a few moments here and there which amounts to maybe fifteen stitches at a time, usually. But, it was well worth the wait. 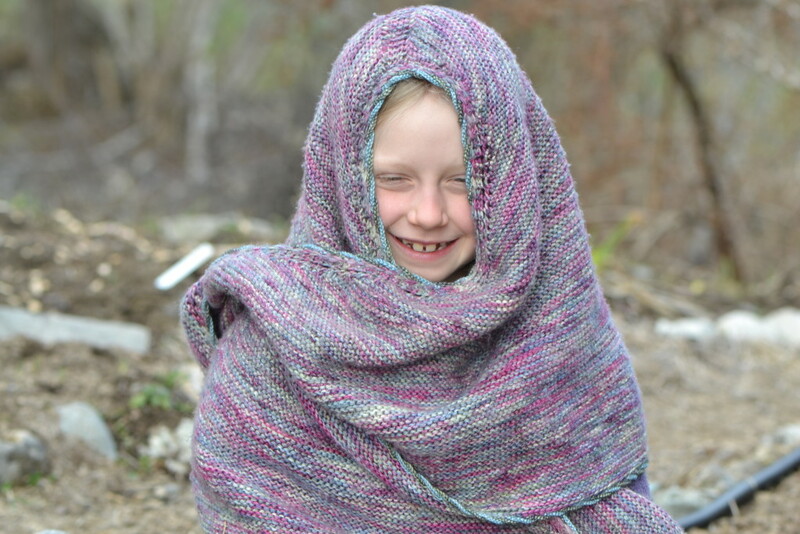 I have wanted to knit a wrap shawl for a few years, but couldn’t settle on the style. 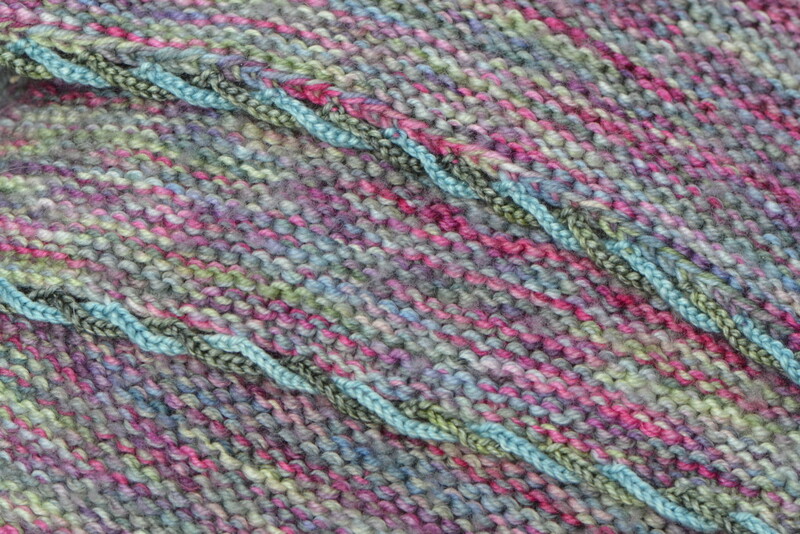 And then, I was so undecided about the yarn…I think I waited on that for a year and a half! I like this pattern because the curve on the inside hem of the shawl follows the body, preventing it from sliding down the shoulders like other wrap shawls are apt to do. It is a tidy fit, too, and doesn’t look sloppy once tied in back. It really is a lovely thing to wear a shawl and have both arms free…a very practical advantage to most other shawls I’ve worn. Another feature I like so much is the crocheted edge twist in contrasting colours…I admit I was a little hesitant to give it a try as I’m not a crocheter, but it was ever so simple, really. I fussed with it until I found the gauge I liked and then spent the better part of a week adding the decorative border all along the edging. Someone else has spied this shawl…she’s giving me her best big smile to see if we can share…I do believe she’s a little hard to resist, this girl of mine. Joining Ginny and others doing the Yarn-Along, here. That is a beautiful shawl. I appreciate the hands-free aspect. That’s why I am quite a fan of ponchos that only reach the elbow. I can even cook in them! I agree that every shawl is a bit of a slog. But worth it! It was definitely worth a wait! 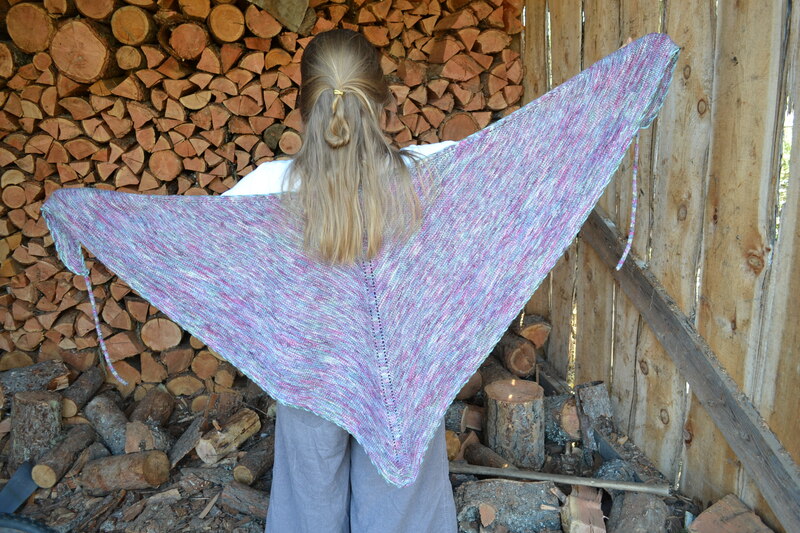 What a grand cozy shawl! Thank you, Alina…cozy it is, for sure! Just right for the moody month of March. That is a lovely shawl, and that crocheted edging is wonderful! Where did you get the pattern? Oh, I just saw that you had Ravelry notes linked. Scrap that question. Yes, it was a pattern on Ravelry. 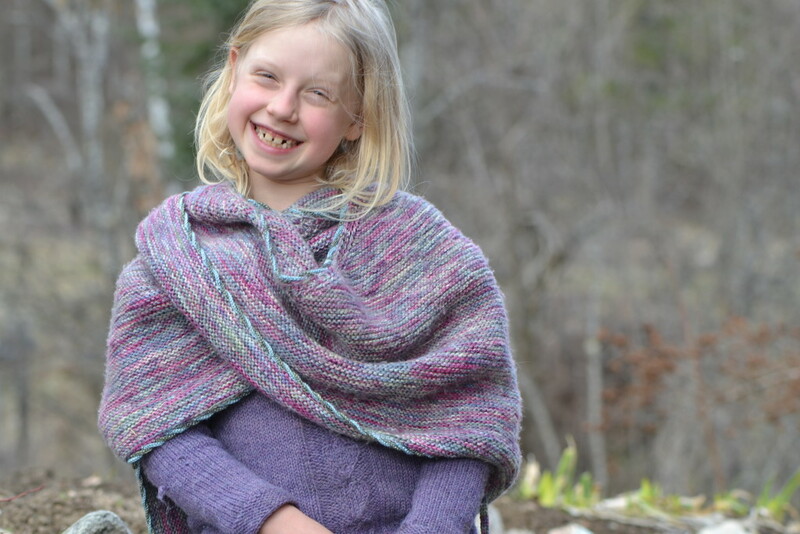 I gather that this kind of wrap shawl is a Danish thing, I think. I love it…very comfortable without sliding off. And you can really have fun with the edging or go very subtle. 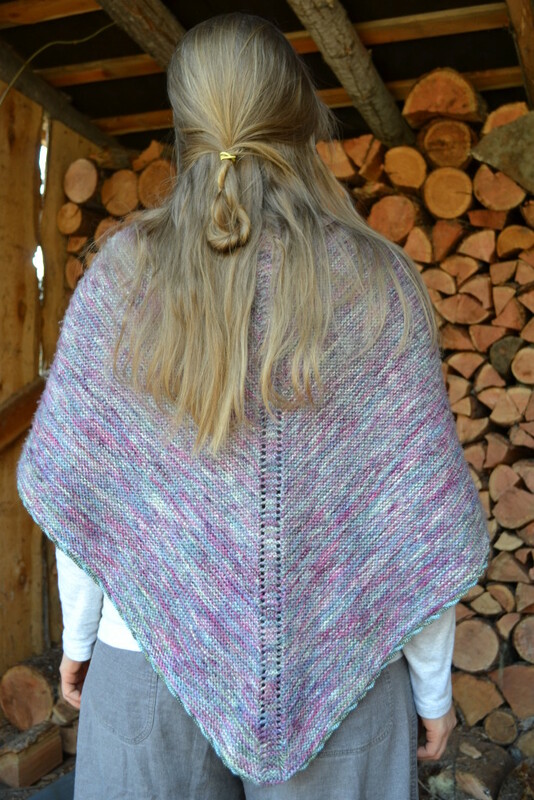 Such a gorgeous shawl!! And I love how you did the edging it is just perfect for it!! and well knitting is made for sharing right!! Hi Alisa and thank you! I was nervous about doing that edging with such different colours and crocheting which I’m not too familiar with…but it worked. I’m going to file away finishing knits because it really is simple and effective. Oh Jules its so beautiful- and so are you! I think I’d like to do this one for me- I end up wearing all my shawls as scarves because they’re too hard to wear with busy hands! I don’t have the time to sit and knit for long periods either… I miss being able to, but I know those days will come again! 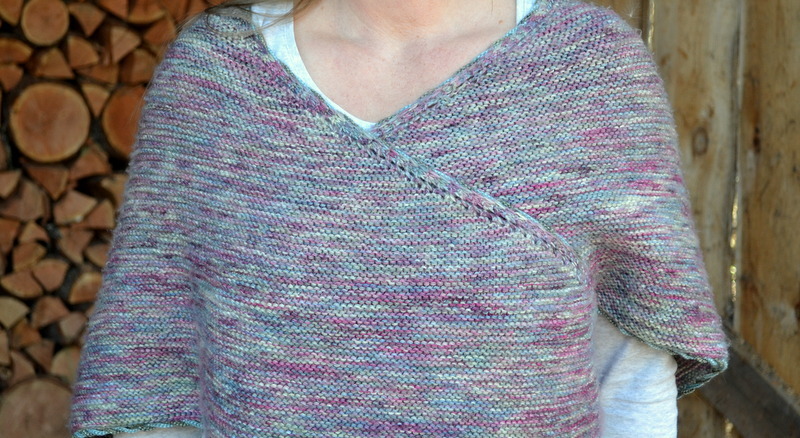 Yes, Melly, this one is a good knit…easy peasy and very functional. I know what you mean about the shawls-to-scarves thing which is why this one is so appealing. And my friend, we must pick our knitting project…I’d love to get started! So much to chat about…maybe a phone call soon? Beautiful. The colour of the wool is lovely and subtle. What wool did you use? Also do you think it would be hard to enlarge the pattern for a heavier set lady? Thank you, Therese. 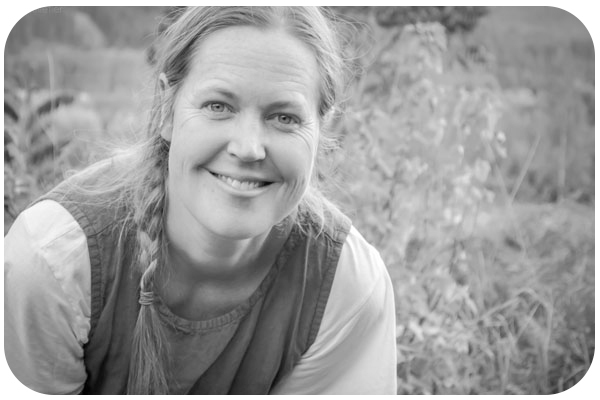 If you click on my ravelry notes at the bottom of the post, it will lead you to the yarn and pattern info. I hope that helps. 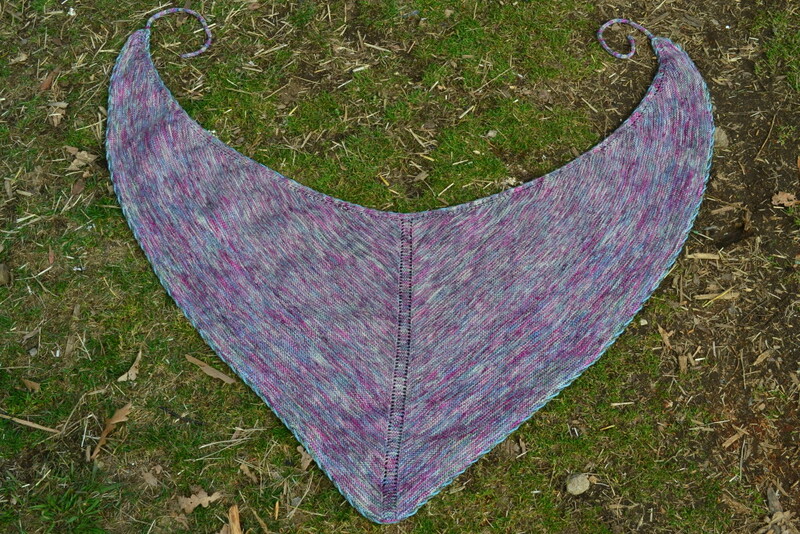 And yes, this is for sure a one size shawl…because it wraps around the body, I imagine you just make the ties longer. It is very forgiving, I believe. Good luck with your knitting! It’s wonderful! 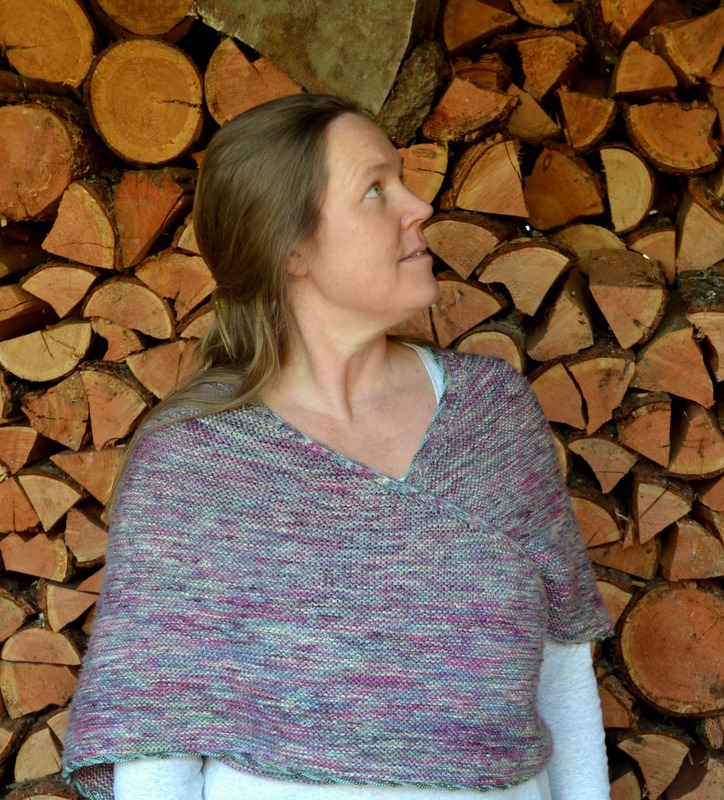 Really useful to hear your review, thank you – a shawl that doesn’t slip is golden! I love that adorable picture of Sunshine. I hope you both enjoy this beautiful knit. Thank you, Tania! And so far, we have shared this well! It’s beautiful! We are also in the phase of life in which we cannot focus on something else while the children entertain themselves. Our boys are 5 and 2, and I suspect we have a long way to go! Hi Elizabeth, thank you. I suppose all we can do is embrace the season of life we are in and trust that one day we will have a little bigger window to do other things. I love it! The colors are beautiful!